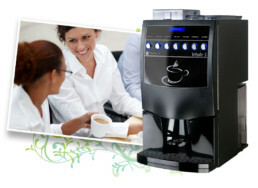 The Vitale is a compact and fully functional hot drinks machine available in bean to cup and instant versions. With a choice of up to 7 Coffee Shop quality hot beverages the Vitale is the perfect drinks solution for the small to medium business. Serve Espresso, Americano, Café Latte, Cappuccino, Chocolate, and ChocoLatte plus hot water for making tea and other beverages. The standard model has an internal water tanks but a plumbed version is available. Easy to refill and maintain. Use your own mug or any paper or plastic cup. Optional base cabinet with integral cup dispenser.